Why not treat someone you know to the perfect gift. A relaxing Complementary Therapy treatment. A Reflexology Treatment or a Massage, is a wonderful way of making someone feel both special and pampered… as well as re-energised. Treat yourself to a Reflexology treatment and help boost your immune system as well as re-energise and help alleviate stress-related problem. Whether as a treatment for a medical condition, or just a special treat, a Gift Voucher for a Complementary Therapy Treatment is a fantastic gift to give. 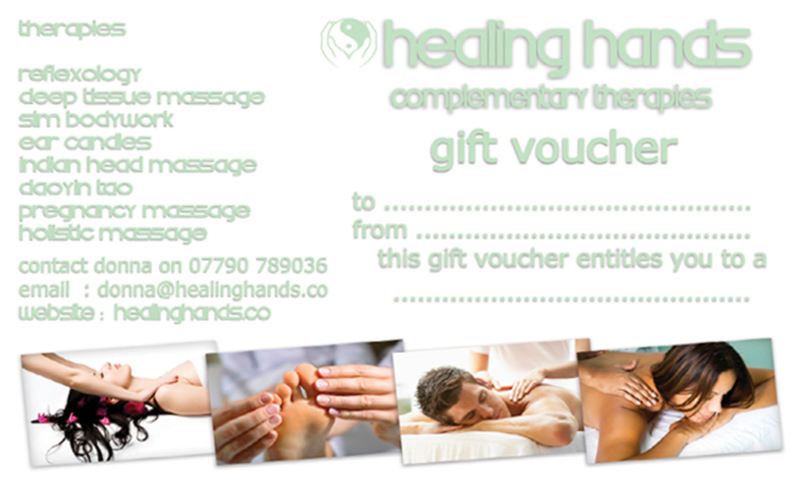 My gift vouchers are available for a one off treatment or even a complete course of therapies. I also have a Special Offer, whereby if you pay for five treatments, you will receive the sixth for free! Or you can also pay for three treatments and receive the fourth, for half-price! Discounted rates for firms offering Reflexology sessions to their staff.